Honor Roll graphic courtesy of Metro Creative. 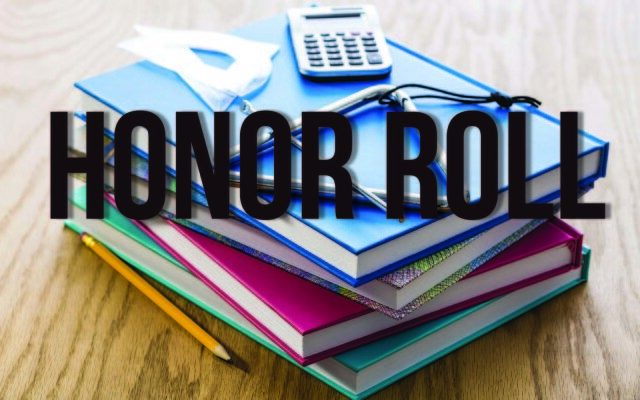 Katahdin Middle/High School has announced the first-trimester honor roll for the 2018-19 school year. The following were included. STACYVILLE, Maine — Katahdin Middle/High School has announced the first-trimester honor roll for the 2018-19 school year. The following were included. GRADE 12 — High honors: Alyssa Barlyski, Abigail Jordan, Lauren Somers and Evan Tapley. Honors: Josie Brownlee, Lindsay Drew, Ahren Harrison, Rheannon Kaelin, Hannah Kyllonen, Erin Lake, Haley Landry, Madison Landry, John McNally, Emerald McNutt, Victoria Morales and Guy Rogan. GRADE 11 — High honors: Felicity Fleming and Shelby Lewis. Honors: Lorin Clendenin, Shanequa Foss, Jordyn Gardner, Caleb Giles, Johnathan Hartt, Blake Howes, Lauren Humphrey, Brady Kaelin, Alexis Lane, Dawson McKenney, Savannah O’Hara and Keegan Owens. GRADE 10 — High honors: Hannah Boone, Silvia Hartt and Emma McGraw. Honors: Staci-Lea Anderson, Riley DeTour, Danielle Libby, Paul McMoarn, Emma McNally, Kaden McNally, Elizabeth Sayler, and Gracie Theriault. GRADE 9 — Honors: Bradley Bailey, Emily Beyer, Aloura Fleming, Justin Hurlbert, Brittney Kaelin, Nikita Keim, Victoria Lau and Kayla Pasons. GRADE 8 — Honors: Leif Ammerman, Alexander Berberian, Isiabelle Brownlee, Melanie Craig, Madison Delano, Alexis Fitzpatrick, Alexis Gardner, Natalie Green, Charlotte Hartt, Jeffery Martin, Maggie O’Hara, Chloe Rickards, Grady Ritchie and Riley Ryan. GRADE 7 — Honors: Julia Sponheimer. GRADE 6 — High honors: Fiona Ammerman and Samuel Boone. Honors: Wyonna Gockley, Addison Heath, Mackenzey Johnson, Maddox King, Mickenzie Landry, Breana Lane, Skyla Lewis, Joshua Martin, Brenden Pocock, Maddox Rowlings, Emma Schmidt, Chandler Smith and Jayden Stevens.